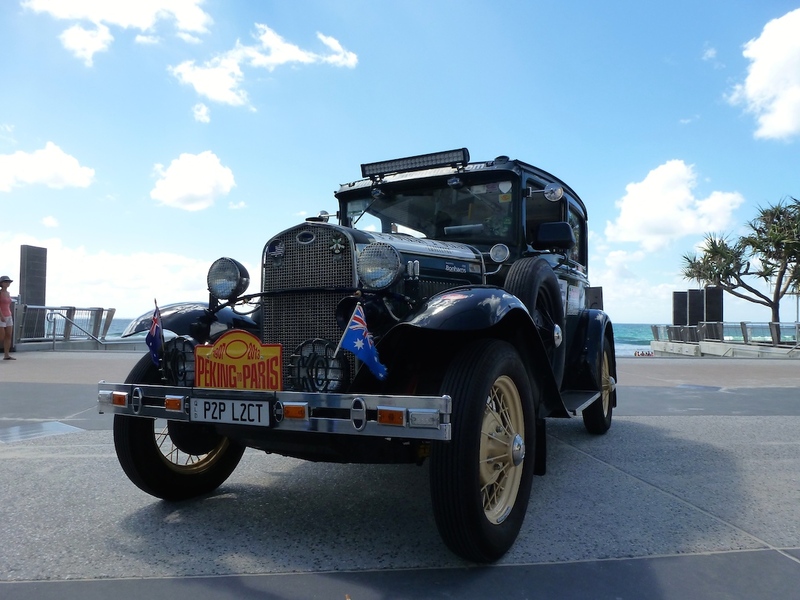 After not one, not two but three gruelling trips last year in the Peking to Paris Rally, the first attempt at the Ocean 2 Ocean USA and the World Record setting final journey, our 1930 Ford Model A aka Tudor Rose has been having a well earned rest. But with the next adventure, the Ocean 2 Ocean Australia, only weeks away, we’ve got some serious work to do to get the car ready for action. First up was a full evaluation from Rod Wade… well he knows the car better than anyone. After careful analysis of the engine that did the o2o USA it was decided at the last minute to replace the engine with a new rebuilt one from Schwalms in the USA. Obviously this wasn’t great news when we’ve got to get it built and then transport it from the other side of the World! But thanks to Ora Landis, the new engine has now arrived and after three days hard slog, is now ready to start its road trial. Fingers crossed all will be ok and ready to go as co-driver Austen Ritchie is yet to have his 1000k trial run prior to the start on June 3rd. The engine that has been removed from Tudor Rose has had a complete strip down and been rebuilt so it can be carried in the Mercedes Vito support van as an emergency spare along with a host of other spares that we hope we won’t need! Engine and bearings out! Doesn’t look good. Part of my service procedure for Tudor Rose is to cut the oil filter open, wash all parts in petrol and strain through a black cloth to look for metal particles etc which is a clear indication of what is happening within the engine. This is what I found, particles of aluminium obviously from the bearings. Because one of the biggest engine killers is overheating I have decided to fit an electric water pump and fan from my friend John Benson at Davies Craig. The advantages of this magic system is that no matter what the engine revs are the water pump and fan operate at maximum water flow and air flow controlled by a ‘smart box’ on the dash which I can pre-set at whatever temperature I need and both the water pump and fan work accordingly to regulate the temperature. Fantastic. With the electric fan now fitted it was time to test run the engine. The result was amazing. Temperature was controlled even without the ram air factor. Ram air is the term used for the air that is pushed through the radiator as the car is driven down the road. Some race cars do not have fans at all. Another reason for my Davies Craig set up is that it only operates when needed whereas a belt driven fan works all the time and robs power from the engine. When on constant drives ‘ram air’ is all that is needed to keep the engine cool. Older cars always had the fan running and robbing vital horsepower. One of the important components of a cooling system is to ensure that the radiator water is treated to give the best performance. For the o2o OZ I am using Penrite products entirely. In particular I am using Penrite 10 Tenths RACE COOLANT. This is a coolant that lasts 3-5 years and reduces ‘hot spots’ especially in older cast iron engine blocks and heads and helps reduce small steam pockets that are sometimes caused by water having a high capillary attraction to odd spots in the engine. My experience is that Penrite 10 TENTHS RACE COOLANT prevents this from occurring resulting in more efficient cooling. If you own a vintage or classic car you will know how difficult it can be to find a replacement screen. Rod needed a screen and hunted for hours before he came across Tom Robertson from www.windscreensforcars.com.au. Tom was quick on the job, located a screen and fitting on site took just over an hour. Brilliant work Tom. appear at the tailpipe. This is because the pistons rings are not seated. The piston rings can take up to 1,000 miles to seat to the cylinder wall. After the last 15 minute run is completed, run the engine for 30 minutes. in high temperature climate areas I use the 25w-70. definitely ready for the road.